A doula is a woman who is trained to provide physical, emotional, and informational support to mothers-to-be and their partners before, during labour and birth, and postpartum. Doulas work alongside physicians, midwives, nurses, and birth partners, and are endorsed by the Society of Obstetricians and Gynaecologists. Experienced, certified doulas are considered part of the obstetric team, as they help couples minimize obstetrical intervention through informational and emotional support, and maximize their satisfaction with their birth experiences. Get in touch with Suzanne! How do doulas differ from midwives? Doulas do not provide clinical tasks. Non-medical skills include explanations of medical procedures, 24 hour informational support during pregnancy and postpartum, positioning suggestions during labour and birth, massage and other non-pharmacological pain relief measures, reassurance, help with breastfeeding preparation and beginnings, and most importantly, a constant nurturing, helpful and objective support as well as first-hand knowledge and understanding of what the labouring mother is going through. This benefits both the mother and her partner. Does a doula replace the birth partner’s role? On the contrary! Her presence strengthens the birth partner’s role. Pressure to know how to help the labouring mother is removed. The doula anticipates the physical and emotional needs of the labouring mother as labour progresses, and helps the partner to better help her during this trying time. This is such an intimate and private time. Does the doula interfere with that? 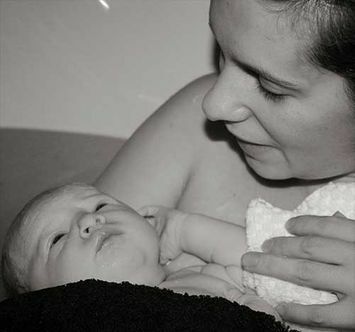 Contrary to popular belief, the doula-assisted birth is even more intimate. Early labour can take place comfortably in your home. Dim lighting, soothing music, warm water, and relaxation: all are encouraged by the doula, who records events as they unfold, to create a birth timeline to treasure always. The emotional bond and sense of connection between mother and partner is important, and the doula knows when to stay in the background when the couple is doing well, and when to jump in and offer guidance, such as position changes and breathing variations, as labour progresses. Isn’t the doula a stranger? You will have spent many hours getting to know your doula during hour-long prenatal visits, and on an on-call basis with weekly communication during the last month of your pregnancy. She will be the professional you are very comfortable with in your home. She will be a constant presence in the hospital, unlike other maternity staff who unfortunately have shift changes. Like them, however, she is not an emotionally-involved family member who may find it difficult to witness their loved one during the hard work of labour. Why does the Society of Obstetricians and Gynaecologists, as well as the World Health Organization, endorse doula support? Unfortunately, there have been nursing cutbacks in our medical system. The result of this is that nurses often have more than one couple under their care, and how busy the Maternity Unit will be at any given hour is very unpredictable. While the doula is not a nurse, she is a constant presence when medical professionals leave the birthing room. She is a trained childbirth professional who understands the labour and birth process. When a labouring woman feels safe and secure, is constantly reassured and is less frightened, labour progresses. Oftentimes, obstetrical interventions are minimized so that the mother can trust and allow her body to give birth, all the while feeling safe and secure. The doula must abide by a Code of Ethics and Standards and Scope of Practice. Certification is highly recommended. Are there differences between doulas? Doulas come from all backgrounds and differ greatly with their experiences as well as their philosophies. Training and certification programs vary greatly. While certification is highly recommended, it is not mandatory. Some doulas have Childbirth Education Certificates, while most do not. We offer a complimentary consultation, support during your labour and birth, and more.